Squad goals. Too hipster for y'all. East Village Coffee Lounge is a unique, eclectic and comfortable coffee lounge. Enjoy organic coffee/espresso, small bites, beer/wine, poetry, live music. 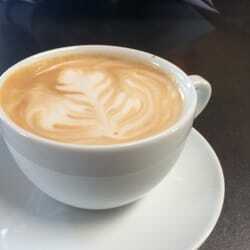 East village coffee lounge is proof that Monterey can have a cool local coffee house that's comfortable, stylish, features locally produced food, and art and serves as a meeting place for the community. Friends rendevous, business meetings transpire, strangers meet, and art and events just happen at The Lounge. All of Monterey seems to pass by The Lounge's central location at one time of another during each day. The Lounge is situated in a historic building situated on a popular public plaza just three blocks from the beach and right in the heart of downtown. The lounge and the plaza seem to function as one as locals and out of town visitors have a choice of sunny plaza seating or indoor style and ambience. Come on in for a quick cup of coffee. If you do, you just might decide to stay a while, meet some friends, enjoy some entertainment, and experience the flavor of the locals' Monterey.